You've probably heard the expression, "Do what you love, and you'll never work a day in your life" — and it's sort of true. Certainly, given the choice, most of us would prefer to work at jobs that feed our soul, as well as our bank accounts. That said, even a beloved job can be rough if it eats all your time and energy, or stresses you out to the point where you can't enjoy the rest of your life. For these reasons, it's useful to consider the relative stress levels of various occupations, when you're contemplating a change to a new career path. Love math and statistics, and want to work a relatively low-stress, 9-to-5 job? You might be happy as an Actuary. Actuaries often work for insurance companies, analyzing risk and helping their employers minimize costs. This job is expected to grow 18 percent by 2024, much faster than average. If you want to help people, and you don't mind investing in several years of postsecondary education, audiologist might be the perfect job for you. Audiologists diagnose hearing loss and other ear problems. It's a good-paying job, earning a median salary of over $60,000 per year. There's also the promise of job security: this job is projected to grow 29 percent by 2024, according to the Bureau of Labor Statistics, due in part to the fact that an aging population is more likely to need these services. Sometimes called IT Manager, this occupation offers a potential six-figure salary at the high end of the range. People in this job are responsible for planning and coordinating computer systems for companies. Fair warning, though; although the job is still fairly low-stress, 2 out of 5 IT managers reported working more than 40 hours a week in 2014, according to information from the Bureau of Labor Statistics. The demand for IT Managers is expected to grow 15 percent by 2024. People with these jobs work in all kinds of settings, from hospitals to clinics to government offices. Their role is to help people achieve a healthy lifestyle through diet, whether it's to lose or gain weight or to manage a disease like diabetes. This occupation is expected to grow 16 percent by 2024. Beyond a certification and licensure in your state, you don't need a formal degree to become a hair stylist, but you do need natural talent — as well as a knack for getting along with people and being able to understand what they're hoping to achieve with their look. 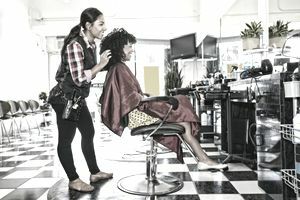 Hair Stylists don't earn as much as other jobs on this list, but they do frequently have a great deal of flexibility, as nearly half work for themselves. They're also in an occupation projected to grow 10 percent by 2024. The demand for mathematicians is high — the Bureau of Labor Statistics projects that this occupation will grow 21 percent by 2024, thanks to the need for businesses to analyze high volumes of data. Mathematicians may also work for the federal government. Lab Technicians collect and analyze samples for hospitals, doctor's offices, and diagnostic labs. The Bureau of Labor Statistics predicts that this occupation will grow 16 percent by 2024. In contrast to some of the jobs on this list, Medical Records Technician is a lower-paying job, but it's also one you can do with little education — many hospitals or doctor's offices require only a non-degree certificate from their Medical Records Technicians, although some may require an associate degree. This job is also expected to grow by 15 percent by 2024. Speech Language Pathologist (or Speech Therapists) diagnose and treat all manner of speech and swallowing disorders. This occupation is expected to grow by 21 percent by 2024. Speech Therapists typically need a Master's Degree and licensure in their states in order to practice. If you love writing and have the ability to understand complex concepts and explain them to almost anyone, you might think about this career, which is expected to grow 10 percent by 2024.